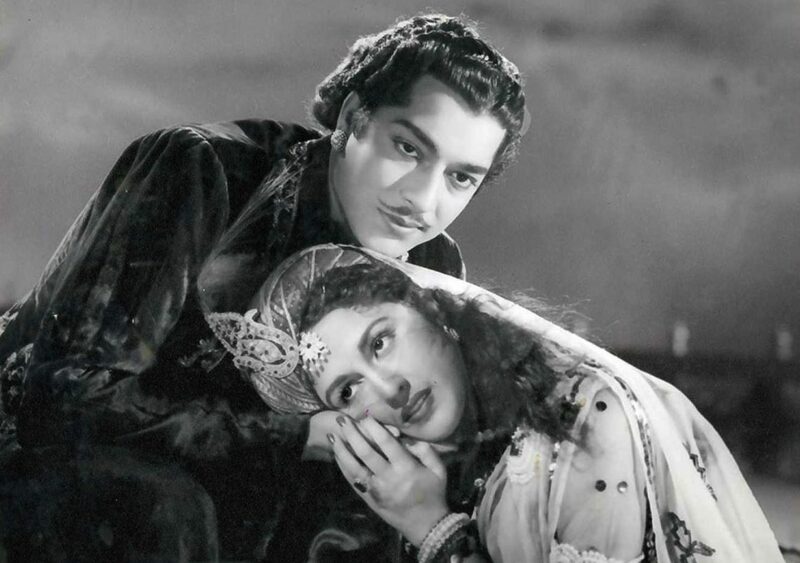 Even as K Asif had begun his magnum opus Mughal-e-Azam based on the legendary Salim-Anarkali romance years earlier, Filmistan, though beginning their rival version much later came out with their presentation, Anarkali, in 1953, a good seven years before K Asif’s masterpiece! The film. starring Bina Rai, Pradeep Kumar and Mubarak, was also a huge success at the box office whose highlight is a scintillating musical score by C Ramchandra. The Anarkali-Salim legend is unsupported by historic evidence but the story of thwarted youthful love in conflict with convention and authority provides rich dramatic material with immense popular appeal. It is no surprise therefore that this popular legend has been filmed many times on the silver screen. But while in Imitiaz Ali Taj’s play of 1922, she was a slave girl, K Asif used her as a court dancer in Mughal-e-Azam. Anarkali does not acknowledge the play and claims to be a direct, unmediated treatment of the Mughal legend, where Anarkali is again the court dancer. The film is directed by Nandlal Jaswantlal who assisted the great Chandulal Shah and directed films for his Ranjit Studio from 1929-1933 before joining Imperial Film Company where he directed Sulochana in several of her films. However, Jaswantlal remains best known for his two immensely successful musicals for Filmistan, Anarkali and Nagin (1954). Jaswantlal was known for his sophisticated lighting and use of extreme close-ups and unusual angles. In Anarkali too, he sustains his use of emphatic close ups throughout displaying the visual flair his work had attracted in his Imperial films. While comparisons with Mughal-e-Azam are inevitable, though coming definitely second, Anarkali stands alone on its own merit as well. The film more than capably handles its emotional episodes and its high voltage dramatic scenes, while the war scenes are choreographed elaborately enough. However, the sets, costumes and backdrops come nowhere close to Asif’s magnum opus. 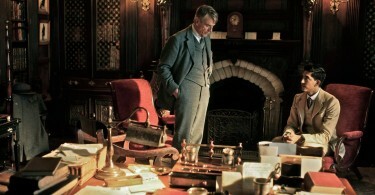 In fact, it is here that the film looks too ‘set like’ and stagy. Another major factor that lets down the romance is that in Mughal-e-Azam we see and feel the entire Salim-Anarkali romance from the beginning right through to its tragic end but Anarkali opens with Salim and Anarkali already in love as she sings Yeh Zindagi Usiki Hai to him. And though the love story plays out faithfully to its tragic end, the intensity of Mughal-e-Azam is somewhere missing. Anarkali sees Bina Rai play the most famous role of her career and one she will be identified with forever. Introduced to Hindi films by Kishore Sahu with Kali Ghata in 1951, Bina Rai went on to a pretty successful career as heroine in the 1950s and early 1960s acting with most of the top heroes of her time. To her credit, though always unfavorably compared with Madhubala’s finely modulated performance in Mughal-e-Azam, Bina Rai still does a great job playing the title role in her own right although the less said of her dancing skills, the better. Pradeep Kumar, never the best of actors, is just about adequate enough as Salim. Anarkali is one of the films that set him on the road to playing leading men in various historical romances like Durgesh Nandini (1956), Shirin Farhad (1956), Rajhath (1956), Patrani (1956) and Taj Mahal (1963). Of the supporting cast, Mubarak leaves an extremely strong impact as Akbar making splendid use of his strong powerful personality and rich voic,e while Kuldip Kaur deliciously vamps it up in the role of Bahar who tries to thwart the Salim-Anarkali romance at every level. Sulochana, the silent film superstar, plays Rani Jodhabai. For Sulochana this was the third Anarkali she has worked in, having played the title role in a silent version of the film in 1928 and then in its talkie remakes well in 1935. The music of the film is by C Ramachandra with lyrics by Rajinder Krishan and is without doubt the MAJOR standout highlight of the film. The music in Anarkali represents some of the finest work in C Ramchandra’s career and sees some of the best singing that Lata Mangeshkar did in her entire career. While every song is an unquestioned masterpiece, the number that still rises above the others and stands out in both its versions and was also by far the most popular song of the film in both its versions is Yeh Zindagi Usiki Hai. It is a pity that an extremely versatile composer like Ramchandra is more remembered for being influenced by western sounds and instruments like the saxophone or the bongo drums and is known for his light-hearted musical scores like Patanga (1949), Sargam (1950), Albela (1951) and Sagai (1951). In fact, Ramchandra had an extremely strong classical base and was one of the finest composers of the ghazal in Hindi films. Anarkali proves just how effectively ‘Indian’ Ramchandra could be when he wanted to. Apart from Yeh Zindagi Usiki Hai, the other Lata Mangeshkar masterpieces in the film include Mujhse Mat Puch Mere Ishq Mein Kya Rakha Hai, Aaja Ab to Aaja, Mohabbat Aisi Dhadkan Hai, Zamana Yeh Samjha ki Hum Peeke Aaye and O Asmanwale Shikwa Hai Zindagi Ka besides the duet Jaag Dard-e-Ishq Jaag with Hemant Kumar, who also renders Zindagi Pyar Ki Do Char Ghadi Hoti Hai. Interestingly, there is one female solo in the film that is not sung by Lata Mangeshkar. Aa Jaan-e-wafa is rendered by Geeta Dutt. It is said that C Ramchandra had a falling out with producer S Mukerji over the music in Anarkali and left the film since Ramchandra wanted Lata for all the female songs in the film but Mukerji was more keen on fellow Bengali, Geeta Dutt. He was then replaced by Basant Prakash who recorded Aa Jaan-e-Wafa, written by Jan Nissar Akhtar, for the film but soon Prakash found himself out of favor as well. Finally, Ramchandra came back into the film on the condition that Lata would sing all the songs but Filmistan still decided to include the Basant Prakash composition as well and incorporated it in the film. It is to Geeta Dutt’s credit that in spite of the whole film being an out and out Lata show, she leaves her unique vocal impress with Aa Jaan-e-Wafa. Following the debacle of Razia Sultan (1983), the historical genre had all but died. in the last few years it has been heartening to see historical dramas like Jodhaa Akbar (2008) and Bajirao Mastani (2015) find favor with audiences. Otherwise, films like Anarkali and Mughal-e-Azam represent an era when the historical romances were an integral part of Hindi Cinema and were mighty successful films too.